Gay's fascination with early coverlets and pattern manuscripts from the nineteenth century has led her on an interesting journey. Her exploration of early weaving started many year ago, when she learned how to weave coverlets through her study of the legacy of the early American weavers. Now the early coverlets and handwritten manuscripts are the resource and inspiration for her handwoven coverlets. 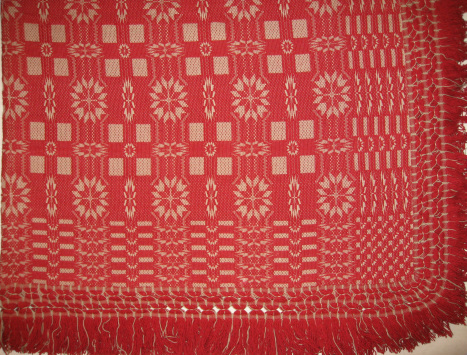 The Coverlet Weaver's Gallery includes photos of coverlets Gay McGeary has woven. Description: Gay's coverlet was inspired by a pattern she found in an early coverlet owned by the National Museum of the American Coverlet, Bedford, Pennsylvania. 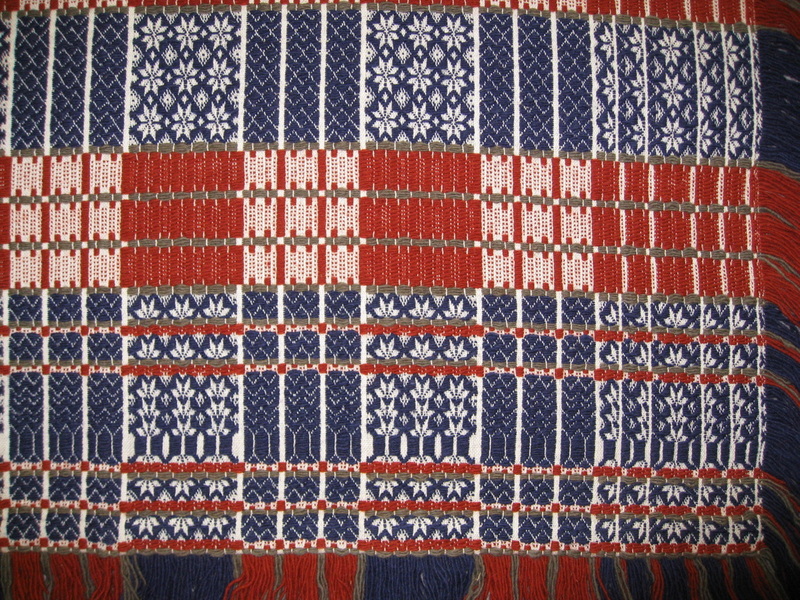 Drafts for this pattern can also found in the nineteenth century manuscript owned by two Pennsylvania German weavers from Lebanon County, Pennsylvania: Joseph Capp and Johnannes Schmidt. Description: You can see the descriptive analysis and photo of the early coverlet which inspired Gay to weave this piece on her Coverlet Notebook page. This coverlet was designed by combining a variation of one star work pattern with the color scheme of another coverlet. The fancy fringe is woven separately and then sewn onto the finished piece. Gay learned about this fringe technique years ago from a friend, Peggy Flowers, who brought her an early coverlet with this interesting fringe. She carefully documented the hand tied fringe and has used it many times.